Winter brings mice and squirrels inside. Although the recent snow fall has been well received by those who enjoy skiing, snowmobiling and other outdoor winter activities, it has left mice, squirrels, and other rodents out in the cold and scrambling for warmth and shelter. If you are suddenly hearing the pitter-patter of little feet in your walls or ceilings, or have discovered droppings, it’s time to get help! Do you hear squirrels or mice? Lately we have been getting calls from concerned homeowners who have been hearing noises coming from their attics and walls and think that squirrels have invaded. 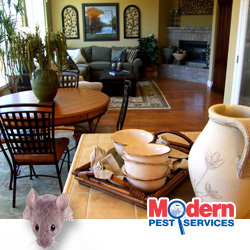 In many cases, our pest control technicians have arrived only to find mice or signs of them, rather than squirrels. People are often misled by these two animals because although mice and squirrels are very similar in nature, mice are generally nocturnal creatures while grey squirrels in particular tend to be active during the daytime. Another misleading clue is the sound mice make. These gnawing critters can make enough noise and sound heavy enough to make people think squirrels have invaded. Ruined appliances – check out this YouTube video about a mouse who takes up winter residence in an espresso machine! Outside of your home, squirrels and mice are known to seek warmth within your car’s engine compartment, creating a potential mess. Do-it-yourself products and treatments such as mouse traps are not always effective and will only catch the rodents that are already in your home. They are not designed to eliminate the conditions that promote rodent activity.